Keep your minimal look flawless in the Cadey-Lee from Schutz! Made of leather upper. Fine ankle strap with buckle closure. Open-toe silhouette. Leather lining. Lightly padded leather footbed. Leather sole. Wrapped heel. Made in Brazil. Measurements: Heel Height: 4 1 4 in Weight: 7 oz Product measurements were taken using size 8.5, width M. Please note that measurements may vary by size. Weight of footwear is based on a single item, not a pair. Dress up your everyday look in the effortlessly chic Schutz Enida sandal. Leather upper. Ankle strap with buckle closure. Open-toe silhouette. Single strap over vamp. Leather and synthetic lining. Lightly padded footbed. Wrapped block heel. Leather sole. Made in Brazil. Measurements: Heel Height: 4 in Weight: 9 oz Product measurements were taken using size 9, width M. Please note that measurements may vary by size. Weight of footwear is based on a single item, not a pair. Keep your minimal look flawless in the Saasha Lee from Schutz! Leather upper. Fine ankle strap with buckle closure. Open-toe silhouette. Synthetic lining. Lightly padded leather footbed. Leather sole. Wrapped stiletto heel. Made in Brazil. Measurements: Heel Height: 4 in Weight: 6 oz Product measurements were taken using size 6, width M. Please note that measurements may vary by size. Weight of footwear is based on a single item, not a pair. Keep your minimal look flawless in the Liffa from Schutz! Leather upper. Halo strap with buckle closure. Peep-toe silhouette. Leather lining and insole. Lightly padded leather footbed. Leather sole. Wrapped stiletto heel. Made in Brazil. Measurements: Heel Height: 3 in Weight: 7 oz Product measurements were taken using size 8, width M. Please note that measurements may vary by size. Weight of footwear is based on a single item, not a pair. Keep your classic look flawless in the Thaynara pump from Schutz! Supple suede upper. Halo strap with buckle closure. Point-toe silhouette. Seductively contoured side panels. Synthetic lining. Lightly padded leather footbed. Leather sole. Wrapped stiletto heel. Made in Brazil. Measurements: Heel Height: 4 in Weight: 8 oz Product measurements were taken using size 6, width M. Please note that measurements may vary by size. Weight of footwear is based on a single item, not a pair. Take your style over the top! Get more from your look with the Schutz Morianna heeled sandal. Supple suede upper. Slingback strap with buckle closure. Open-toe silhouette. Leather lining. Lightly padded leather footbed. Wrapped stiletto heel. Leather sole. Made in Brazil. Measurements: Heel Height: 4 in Weight: 6 oz Product measurements were taken using size 7.5, width M. Please note that measurements may vary by size. Weight of footwear is based on a single item, not a pair. Take your style over the top! Get more from your look with the Schutz Ilara heeled sandal. Strappy patent leather upper. Halo strap with buckle closure. Open-toe silhouette. Leather lining. Lightly padded leather footbed. Wrapped stiletto heel. Leather sole. Made in Brazil. Measurements: Heel Height: 4 in Weight: 5 oz Product measurements were taken using size 7.5, width M. Please note that measurements may vary by size. Weight of footwear is based on a single item, not a pair. Top off your look with the elegant edge of the Schutz Avamel mule. 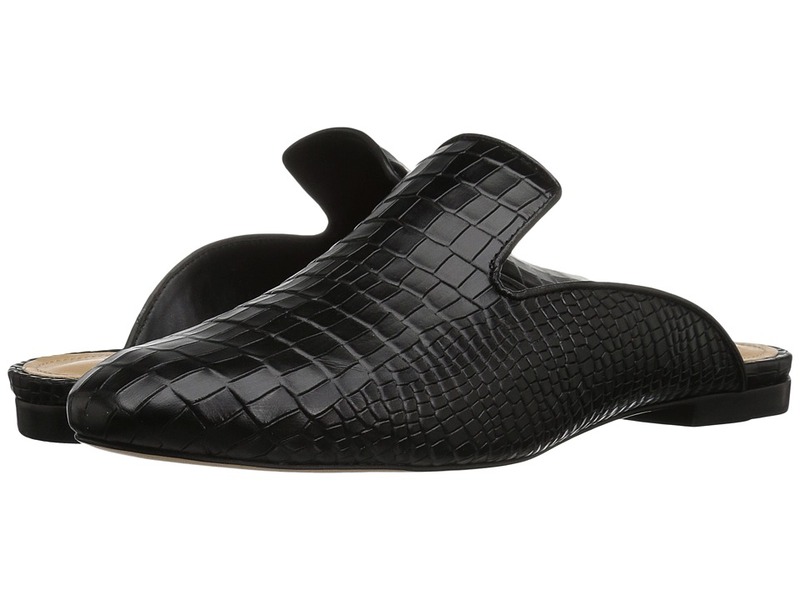 Reptile embossed leather upper. Slip-on design. Round-toe silhouette with open heel. Leather lining and insole. Lightly-padded footbed. Stacked block heel. Genuine leather outsole. Made in Brazil. Measurements: Heel Height: 3 4 in Weight: 7 oz Product measurements were taken using size 9.5, width M. Please note that measurements may vary by size. Weight of footwear is based on a single item, not a pair. Step into a proper profile with the eye-catching Schutz Eurica sandal. Leather upper with embroidery detail. Ghillie lace-up with tassel accent. Open-toe silhouette. Leather and synthetic lining. Lightly padded, non-removable footbed. Wrapped stiletto heel. Leather outsole. Made in Brazil. Measurements: Heel Height: 4 in Weight: 6 oz Product measurements were taken using size 7.5, width M. Please note that measurements may vary by size. Weight of footwear is based on a single item, not a pair.